Then a near-fatal car wreck changes everything. Government agents step in and save Aurora's life in exchange for her services as a vampire hunter. In Alaska. Basically she's a glorified chew toy. All thanks to her rare blood type, which sends a vampire into temporary paralysis right before she has to finish the job... by hand. I loved this modern twist in the vampire genre. The characters are full of life, energy and attitude which makes it very relevant for young adult readers. I loved Aurora and how she dealt with her trauma. She isn't given any choice in the matter of becoming a government assassin/vampire hunter but she faces it head on and deals with it in her own way.I felt that Aurora's emotional transformation after her accident was very well written and I thought that it made her seem more realistic. I could understand why she would grow apart from her normal friends and start hanging out with a more rebellious crowd. 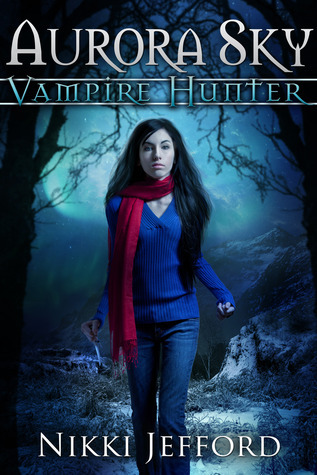 Her change in personality made the story line very interesting and the way she toughens up with each new experience with vampires makes her seem very believable as a vampire hunter. I also loved the supporting characters and I look forward to seeing how Aurora deals with the conflicting task of hunting and killing vampires in general whilst being in love with one of them. The story was fast paced and the narration was excellent. I will definitely be checking out the rest of this series.